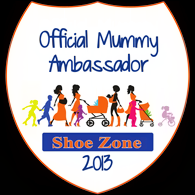 Mummy Of 3 Diaries: Our #peppasthemeparkparty Write Up, So what did we think? 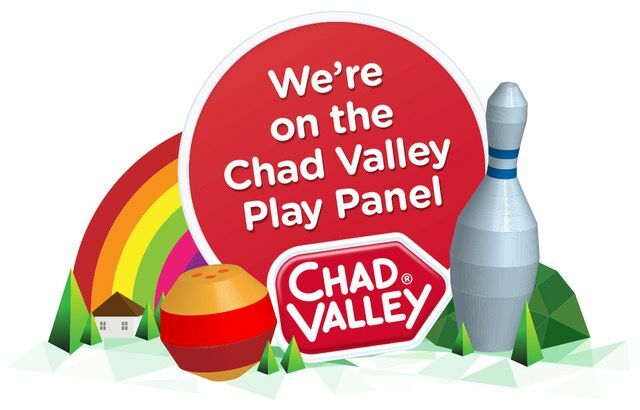 Our #peppasthemeparkparty Write Up, So what did we think? 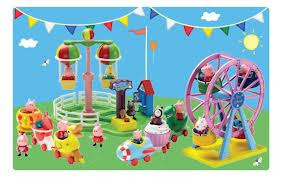 Our Peppas Theme Park Party Toys Thoughts. A few weeks back we hosted our very own Peppa's Theme Park Party to celebrate the launch of Peppa's new Theme Park Toy range. A wonderful time was had by all, we had so much fun. There was fun and games, laughter and prizes. Delicious treats for all and lots of cake too. 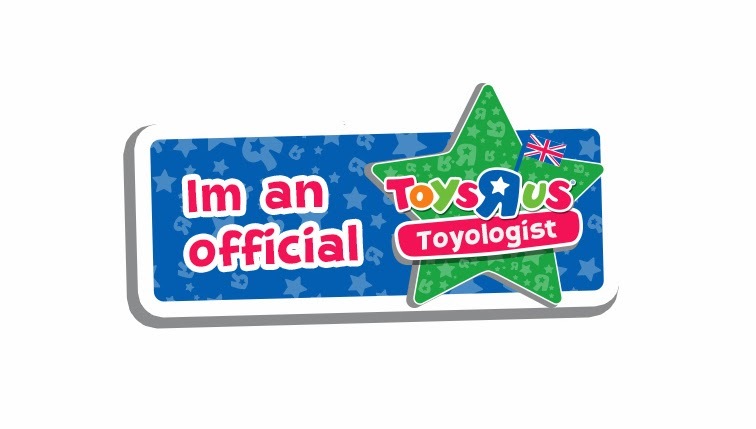 The aim of hosting our party was to share the news about the launch of the exciting new toys range but more importantly we were to play with the toys so that we could tell you what we though. 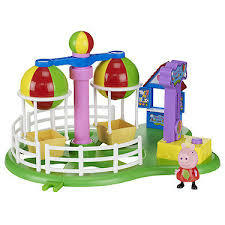 You can enjoy all the fun of the fair with this Peppa Pig Deluxe Balloon Ride Playset. 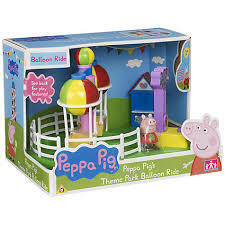 You can spin Peppa round and raise her up high in this amazing Theme Park Balloon ride! Smaller features include, opening the kiosk ready for business and pressing the button to ring the bell! 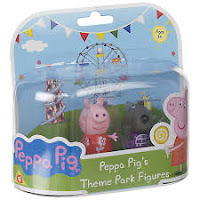 This set comes with an exclusive articulated Balloon Ride Peppa figure which is very cute. The kids loved this one, you can fit two characters in at a time as there are two balloon carriages. The motions and sounds are very sweet and keep the children interested more. 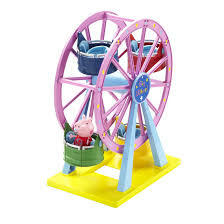 The Peppa Pig Theme Park Big Ferris Wheel is just like the Big Wheel we love at the fair. You can push Peppa round and around, higher and higher on this fantastic big wheel. It includes a very cute, articulated exclusive Peppa Pig figure but there is also room for three more of Peppa's friends on the wheel. There are four carriages in total, meaning lots of fun for more than one player at a time which is great news as this one had lots of interest. 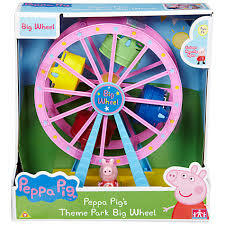 It's easy to slot Peppa and her friends into their seats and spin the Ferris wheel for an exciting ride. We loved this toy, although the concept is very simple the kids adored it, it encourages imaginative play, peer interaction and hand to eye coordination. A firm thumbs up from us here at Mummy Of 3 Diaries and all of our guests. Jumping in Muddy Puddles Peppa is ready for a playful adventure doing her absolute favourite thing which is jumping in muddy puddles! You can watch Peppa jump up and down with her welly boots on. She counts from one to ten and says a few other well known phrases from the show. This one is great, the kids loved counting along with her, it was one of the most popular toys of our party. 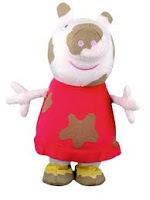 Peppa has a gorgeous plush body that stands up by herself which talks and jumps up and down at the simple push of a button. It's very cute and does look just like the Peppa we all love and see on our TV screens everyday. I quite liked this one too, it's great as a cuddly bear as well as an interactive toy. A huge thumbs up from us here. Peppa Pig's Fun Park Train Ride is a cute little train made up of cute little carriages. 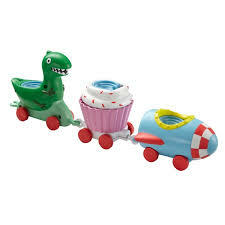 You can put up to three of your favourite characters into the train and take them for a ride in this magic train. You don't get any figures included with this toy but it's the perfect addition to complete the Peppa's Theme Park Toys set. It's nice and bright and full of fun. The character's can be picked up separately so that's not a problem. My little man love this one as he's a huge train fan, he just sat there pushing it around for ages. It's great, I love seeing him playing like that. 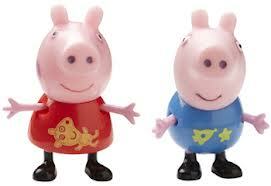 Last but not least we were sent some of the new Peppa Pig and friends figures which are very cute. They're a real close likeness to the show characters which is great news as the kids just love them. They all have moveable limbs and can be made to sit or stand or strike different poses during active play. 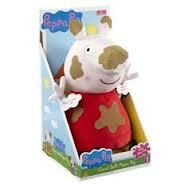 There are lots of characters to collect including all of Peppa's friends. Our Peppa's Theme Park Party was a huge success. 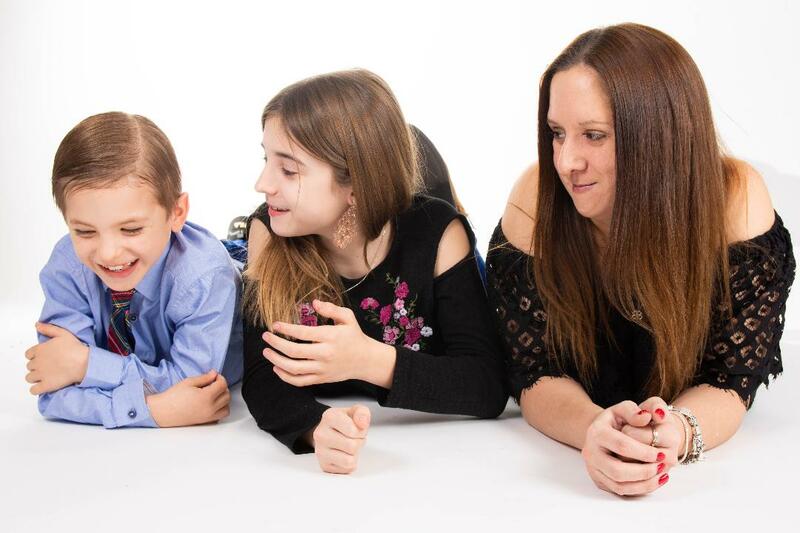 I just want too thank UKMumsTV who made this all possible for us. We love hosting parties and sharing it all with you. Peppa will always be loved in our house, my youngest two just can't get enough. 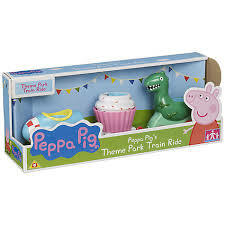 Lucky for me I now have all of these wonderful Peppa's Theme Park Toys to keep them entertained over the Easter Holidays. Thank heavens for small mercies. 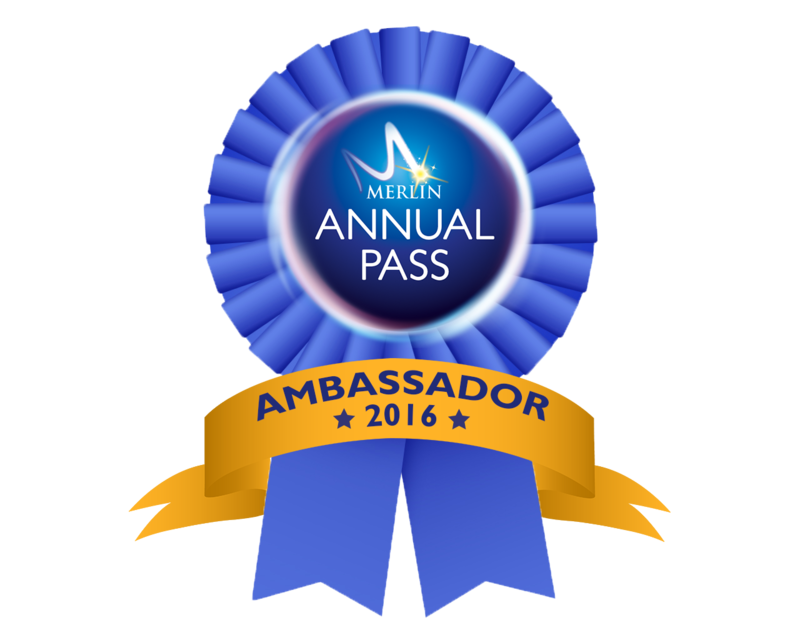 I hope you've enjoyed following our party journey.